Jeff: once our paper is done and our estimates are available hopefully there is no need to use Affinity scores anymore. Middle East votes are not as influential in our estimates as colonialism/human rights and so on (i.e. 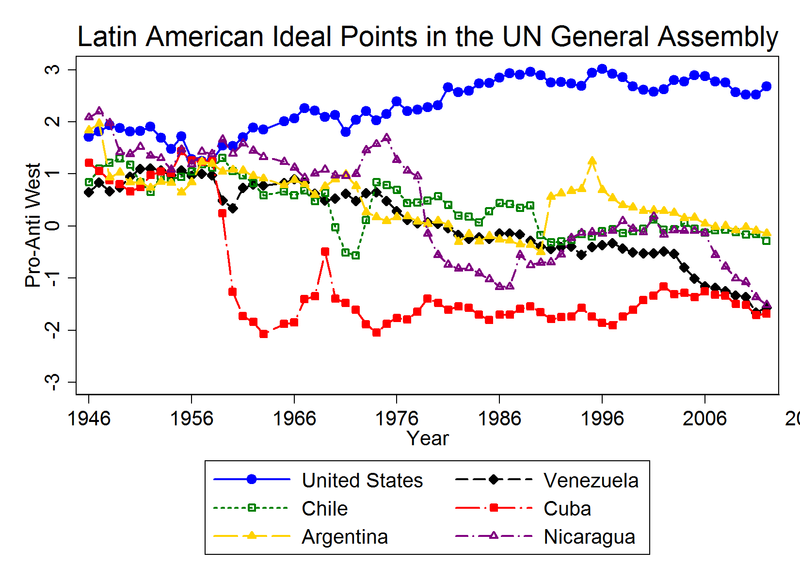 on average their discrimination parameter is lower). However, there is a bigger conceptual issue here: the theoretical concept is NOT foreign policy closeness with the U.S. That is a garbage can concept as far as I am concerned. The concept is ideological predispositions towards a Western liberal order. On that front the Saudi are somewhat far removed from the U.S. They are allies DESPITE disparate preferences on this dimension. I’ll post more on this once we are ready to release some data. The attitude towards Western liberal order sounds very promising. But I’m not sure that means we shouldn’t ever be concerned about affinity. And isn’t affinity all about closeness with country X, whether it is the U.S. or between any two states? Why is that a ‘garbage concept’? It is a garbage can concept because every time we discuss “common interests” or common preferences” we should ask “preferences over what?” if you cannot answer that question, then you cannot interpret a regression coefficient substantively. 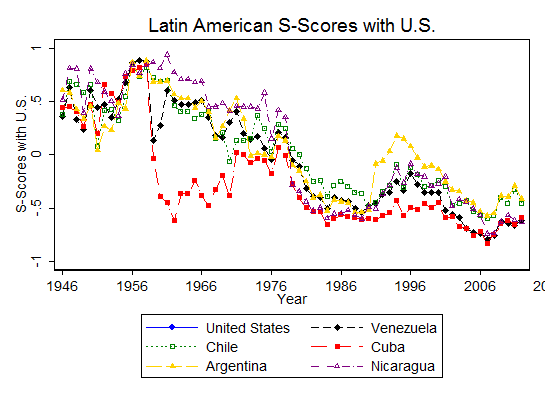 It’s interesting that even after the right-wing coups in Argentina and Chile occurred, their voting patterns continued to drift away from the U.S.’s with little change, in contrast to the big shift away from the U.S. following left-wing coups in Cuba and Nicaragua.